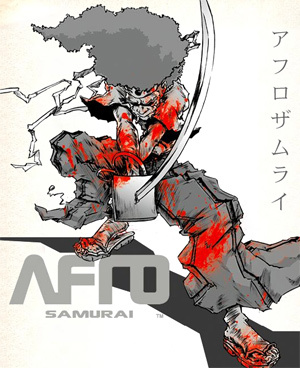 The tale of Afro Samurai is one of bloody hardship and pain. Along his solitary path of revenge for his murdered father, he sheds no tears and knows no love. Forever chased by powerful enemies in a lawless technology-speckled dystopia, he evades bullets and blade to reach his final prey: a man who will not die. But Afro will reach his quarry - even if it means painting a road of blood and brains from here to the bitter inevitable end. Project by Spike TV / FUNimation of US, and Gonzo's Samurai Project team.